When they had the Orly Haute Look sale, I got Au Champagne half-off. I had a feeling I’d be able to stamp with it. I’m so glad I was right! It just has the frostier look than a silver. The burgundy is an old Maybelline Colorama polish called Vampire Seduction, and it somehow still applied really well, like it was still new. The image was from the new Bundle Monster 2012 set, plate BM-323. 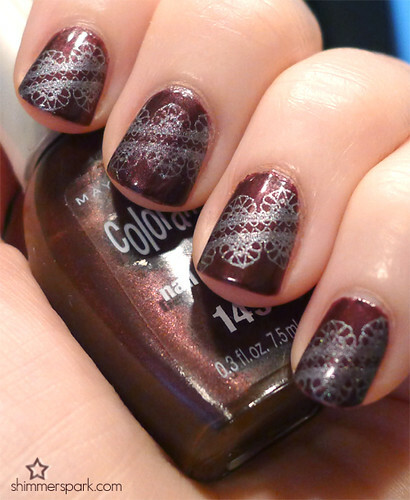 This entry was posted in swatches and tagged au champagne, bm 323, bundle monster, burgundy, colorama, fauxnad, frosty, konad, maybelline, nail art, nail polish, orly, stamping, swatch, vampire seduction, white on November 4, 2012 by hollyshimmerspark.